This article was originally published by the Washington Department of Fish and Wildlife as part of its annual report Threatened and Endangered Wildlife in Washington. Black-backed woodpecker (photo by Joe Higbee). The black-backed woodpecker (Figure 1) inhabits the boreal forests of North America, including the Cascade Mountains, the northern portions of the Sierra Nevada and Rocky Mountains, Alaska, much of Canada, northern New England, and the upper Midwest. In Washington, it is found primarily in the eastern Cascade Mountains, northeastern Washington, and the Blue Mountains (Figure 2; Smith et al. 1997, Leach 2005). The species is rare to locally uncommon in mid- to high elevation conifer forests in eastern Washington and rare west of the Cascade crest (Leach 2005). Black-backed woodpeckers are early post-forest fire specialists, being much more abundant in recently burned forests as standing dead trees rapidly become infested with wood-boring beetle larvae (Buprestidae and Cerambycidae), which are an important part of the diet (Dixon and Saab 2000). Birds quickly immigrate to recently burned locations, with numbers then declining 4 to 6 years post-fire as prey availability decreases (Hutto 1995, Kreisel and Stein 1999). Stand-replacement burns are more readily occupied than burns of low and moderate severity (Kotliar et al. 2002). In the Pacific Northwest, burned coniferous forests with standing dead lodgepole pine (Pinus contorta), ponderosa pine (Pinus ponderosa), and western larch (Larix occidentalis) are typicaly inhabited, although tree species composition is generally not an important factor in determining site use (Dixon and Saab 2000). The species strongly prefers burns that have not been salvaged logged. Individuals were most common at sites with the highest level of snag retention (15-32 snags/ac) in salvage-logged stands in the Washington Cascades (Haggard and Gaines 2001). Birds did not nest in stands with low densities of retained snags (0-5 snags/ac). In burned ponderosa pine/Douglas-fir forest in southwestern Idaho, Saab and Dudley (1998) noted that black-backed woodpeckers favored units that had not been salvage-logged, and nest sites were typically in unlogged units with a relatively high density of small hard snags (>50 snags [>9”dbh]/ac). Whether burns are essential for population persistence is uncertain. Black-backed woodpeckers also occur in beetle-ravaged forests (Bull et al. 1986, Bonnot et al. 2008) and in low numbers in unmanaged or mature forests (Bevis 1994, Leach 2005). Winter densities were twenty times higher in burned forest than unburned forest in northeastern Washington (Kreisel and Stein 1999). Little is known about black-backed woodpecker habitat needs and population dynamics in unburned forests. Several studies suggest that unburned forest is sink habitat, where the species persists due to emigration from recent burns (Hutto 1995, Murphy and Lehnhausen 1998). Frequency of fire within the dispersal range of individuals may therefore be a key determinant in species presence (Murphy and Lehnhausen 1998). Very frequent or large fires, however, may be detrimental because they destroy too much secondary habitat. Bonnot et al. (2008) reported that nest success was similar in both beetle-killed forests and recently burned forests. In the absence of fires, bark beetles (Scolytidae), such as the mountain pine beetle (Dendroctonus ponderosae), become a regular part of the diet (Dixon and Saab 2000). Black-backed woodpeckers excavate nests in the sapwood of trees, while weaker excavators (e.g., Williamson’s sapsucker, Sphrapicus thyroideus) excavate cavities in heartwood affected by fungal decay. Bull et al. (1986) suggested that black-backed woodpeckers often nest in pines because they have a thicker sapwood layer than other tree species of the same size. Threats affecting populations. Historical and recent fire management policies have negatively impacted black-backed woodpeckers by reducing the occurrence of large, high intensity wildfires that create optimal conditions for the species (Dixon and Saab 2000). Goggans et al. (1988) suggested that the traditional approach of managing cavity nesters by retaining a relatively small number of snags and green replacement trees in harvested forest stands may not maintain enough foraging substrate to sustain viable populations of black-backed woodpeckers. Kotliar et al. (2002) concluded that, in general, clearcut forests do not function as substitutes for burned forests. Post-fire salvage logging is also detrimental to the species (Kotliar et al. 2002). Therefore, where salvage logging is planned, it is important to delay any work for the first five years after the fire (Hutto 1995, Dixon and Saab 2000). This span is critical in providing habitat because the woodpecker’s primary food source (wood-boring beetles) becomes less abundant after this period (Caton 1996). Hutto and Gallo (2006) concluded that reduced woodpecker density in post-fire salvage-logged areas is more related to the reduction in food (wood boring beetles) than nest-site availability. Conservation actions. In May 2012, the U.S. Fish and Wildlife Service was petitioned to list black- backed woodpecker populations in the Sierra Nevada, Oregon Cascades, and Black Hills of South Dakota and Wyoming (USFWS 2013). These populations are isolated from the remainder of the species’ range. The petition did not include the population in Washington, which may be contiguous with populations in Canada. Bevis, K. R. 1994. Primary cavity excavator birds in managed and unmanaged grand fir forest habitats in central Washington’s east Cascades. M.S. thesis, Central Washington University, Ellensburg, Washington. 141 pp. Bull, E. L., S. R. Peterson, and J. W. Thomas. 1986. Resource partitioning among woodpeckers in northeastern Oregon. USDA Forest Service Research Note PNW-444. Caton, E. L. 1996. Effects of fire and salvage logging on the cavity-nesting bird community in northwestern Montana. Dissertation, University of Montana, Missoula, Montana. Dixon, R. D., and V. A. Saab. 2000. Black-backed woodpecker (Picoides arcticus). Number 509 in A. Poole and F. Gill, editors. The Birds of North America. Academy of National Science and American Ornithologists’ Union, Philadelphia, Pennsylvania. eBird. 2013. eBird: An online database of bird distribution and abundance [web application]. Cornell Lab of Ornithology, Ithaca, New York. http://www.ebird.org. (accessed 9 May 2013). Goggans, R., R. D. Dixon, and L. C. S. Seminara. 1988. 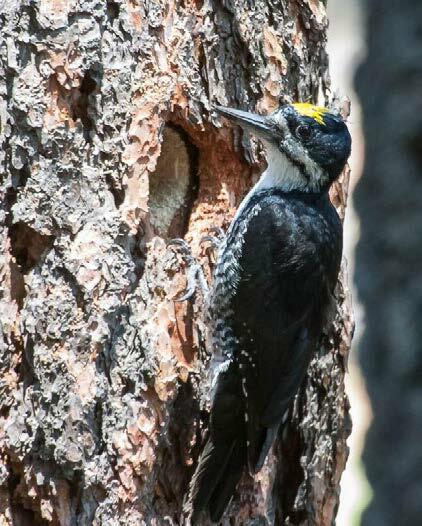 Habitat use by three-toed and black-backed woodpeckers, Deschutes National Forest, Oregon. Nongame Project Number 87-3-02, Oregon Department of Fish and Wildlife, Bend, Oregon. Haggard, M., and W. L. Gaines. 2001. Effects of stand-replacement fire and salvage logging on a cavity-nesting bird community in eastern Cascades, Washington. Northwest Science 75:387–396. Hutto, R. L. 1995. Composition of bird communities following stand-replacement fires in northern Rocky Mountain (USA) conifer forests. Conservation Biology 9:1041-1058. Hutto, R. L., and S. M. Gallo. 2006. The effects of postfire salvage logging on cavity-nesting birds. Condor 108:817-831. Kotliar, N. B., S. Heil, R. L. Hutto, V. A. Saab, C. P. Melcher, and M. E. McFadzen. 2002. Effects of fire and post- fire salvage logging on avian communities in conifer-dominated forests of the western United States. Studies in Avian Biology 25:49-64. Kreisel, K. J., and S. J. Stein. 1999. Bird use of burned and unburned coniferous forests during winter. Wilson Bulletin 111:243-250. Leach, R. H. 2005. Black-backed woodpecker. Pages 240-241 in T. R. Wahl, B. Tweit, and S. G. Mlodinow, editors. Birds of Washington: status and distribution. Oregon State University Press, Corvallis, Oregon. Murphy, E. G., and W. H. Lehnhausen. 1998. Density and foraging ecology of woodpeckers following a stand- replacement fire. Journal of Wildlife Management 62:1359–1372. Saab, V. A., and J. Dudley. 1998. Responses of cavity-nesting birds to stand replacement fire and salvage logging in ponderosa pine/Douglas-fir forests of southwestern Idaho. USDA Forest Service Rocky Mountain Research Station, Boise, Idaho, USA.Research paper RMRS-RP-11. Saab, C. P. Melcher, and M. E. McFadzen. 2002. Effects of fire and post-fire salvage logging on avian communities in conifer-dominated forests of the western United States. Studies in Avian Biology 25:49-64. Smith, M. R., P. W. Mattocks, Jr., and K. M. Cassidy. 1997. 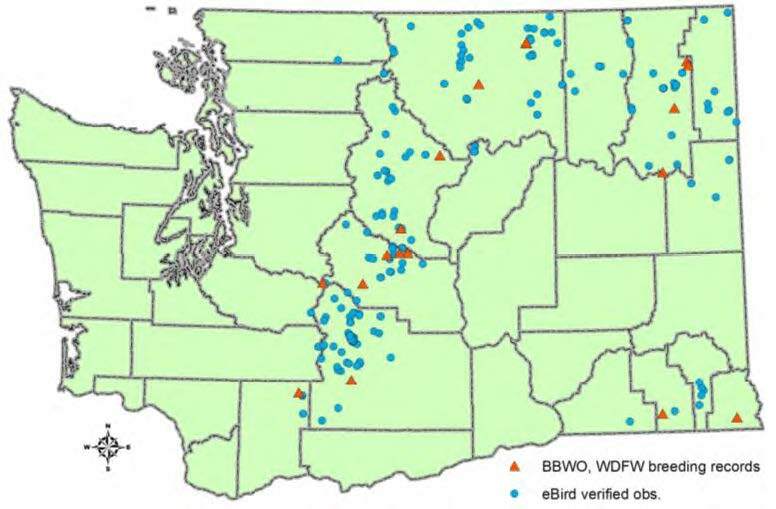 Breeding birds of Washington state. Volume 4 in K. M. Cassidy, C. E. Grue, M. R. Smith, and K. M. Dvornich, editors. Washington GAP Analysis – Final Report. Seattle Audubon Society Publication in Zoology Number 1, Seattle, Washington. USFWS (U.S. Fish and Wildlife Service). 2013. 90-Day Finding on a Petition to List Two Populations of Black- Backed Woodpecker as Endangered or Threatened. Federal Register Vol. 78, No. 68 (Tuesday, April 9, 2013): 21086-21097. Source: Washington Department of Fish and Wildlife. 2013. Threatened and Endangered Wildlife in Washington: 2012 Annual Report. Listing and Recovery Section, Wildlife Program, Washington Department of Fish and Wildlife, Olympia. 251 pp. Species accounts were compiled by Derek Stinson, Gary Wiles, Gerald Hayes, Jeff Lewis, Lisa Hallock, Steve Desimone, and Joe Buchanan. Many other individuals took time from busy schedules to review species accounts or provide information or documents for this report, including WDFW district and assistant district wildlife biologists, research scientists, and people from other agencies. They include Harriet Allen, David Anderson, Hannah Anderson, Keith Aubry, Lynne Barre, Dana Base, Penny Becker, Scott Becker, Gary Bell, Gretchen Blatz, Joe Buchanan, Steve Desimone, Joe Engler, Greg Falxa, Howard Ferguson, Rich Finger, Scott Fitkin, John Fleckenstein, Eric Gardner, Joe Gaydos, Dawn Gedenberg, Gary Ivey, Lisa Hallock, Molly Hallock, Jeff Heinlen, Eric Holman, Steve Jeffries, Mary Linders, Mike Livingston, Russ Mullins, Travis Nelson, Heidi Newsome, Don Noviello, Brent Norberg, Gail Olson, Ann Potter, Scott Pearson, Leslie Robb, Elizabeth Rodrick, Ella Rowan, Lori Salzer, Chris Sato, Tammy Schmidt, Larry Schwitters, Michelle Tirhi, Laura Todd, Matt Vander Haegen, Jim Watson, and Kristin Wilkinson. Joe Higbee and Rod Gilbert allowed use of many photographs. David Speiser kindly allowed the use of his yellow-billed cuckoo photo. Washington Department of Fish and Wildlife. Species accounts were compiled by Derek Stinson, Gary Wiles, Gerald Hayes, Jeff Lewis, Lisa Hallock, Steve Desimone, and Joe Buchanan.